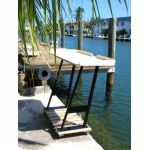 Buck Woodcraft offers both full-size fish cleaning tables and portable fish cleaning stations. You can buy a full-size table top only, or a fully equipped unit complete with sink & faucet, storage shelf or cabinet, and powder coated base in your choice of colors. In short, as basic or custom as you like. 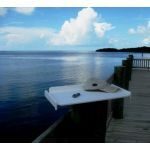 Our portable fish cleaning stations come in 2 sizes, and are available ready-to-use or as easy-to-assemble kits.